The ultimate battle between sisters is nearing, and its outcome could have catastrophic consequences. As sixteen year-old Lia Milthorpe searches for a way to end the prophecy, her twin sister Alice hones the skills she'll need to defeat Lia. Alice will stop at nothing to reclaim her sister's role in the prophecy, and that's not the only thing she wants: There's also Lia's boyfriend James. Lia and Alice always knew the Prophecy would turn those closest to them against them. But they didn't know what betrayal could lead them to do. In the end, only one sister will be left standing. The second novel in the Prophecy of the Sisters series is everything and more than what I was hoping. The magic that Zink created in her first novel is again presented in Guardian of the Gate. In this installment, Lia is on a journey. She must find that which has been lost in order to fulfill her place in the Prophecy. However, along the way, friendships and relationships are tested as Lia learns that the only true person that she may be able to trust is herself. 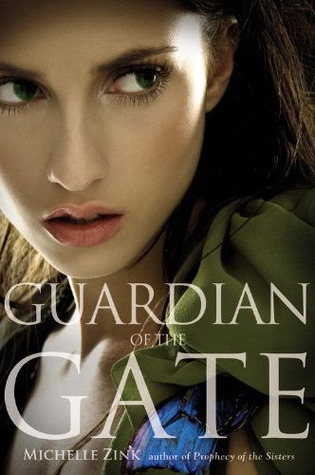 Like the previous novel in the series, Guardian of the Gate completely held me hostage. I quite literally sat down with the novel, and probably did not move until I turned the last page. Zink's writing ability is phenomenal in capturing the essence of hope, love, and even betrayal. The world that has been created is beautifully explored, and so deep that, like Lia, I feel as if I know every nook and cranny. I must admit that Zink surprised me quite a bit with this novel, especially in regards to the romance aspect. While Prophecy of the Sisters did include a sweet romance between Lia and James, the romance in Guardian of the Gate was a lot more mature. I do not want to spoil the awesomeness of Lia's romance, so you will just have to dive right into it just like I did. While it is going to be torture awaiting the third and final installment, I could not be happier with this series. It has so much to offer to its readers. If you have not read the first novel in the series, Prophecy of the Sisters, I recommend that you fix that immediately. And once you have that finished, I can promise you that you will be dying to get your hands on Guardian of the Gate. Wonderful review! I love it when you simply cannot put down a book. I’ve got to start this series right now! oooh, i just got the first book last week! now i can’t wait to start this series! Guess what I just opened from my mail, i’m so happy you have said it is just as good.